HYUNDAI ELANTRA 2011. A true competitor in the segment which will have a low base price of only $14,830. LA JOYA, California - After debuting at Los Angeles Auto Show in its 2010 version, viewers of the 5th generation of the Hyundai Elantra had the opportunity to learn more about its characteristics and performance in the presentation made to the press, which included several hours of operation for the varied geography of southern California. This compact comes to give real competition to the Toyota Corolla, Honda Civic, Chevrolet Cruze, Ford Fusion and Mazda Mazda3. It seems it may be in tune with all of them, since the previous generation wasn't even close, to their class and style. To achieve this goal, designers took as a model the Hyundai Sonata 2011, which since its introduction in May 2010, has been the best-selling car in all segments. From that base, they made a reduction in size, which makes it look smaller but equally attractive. 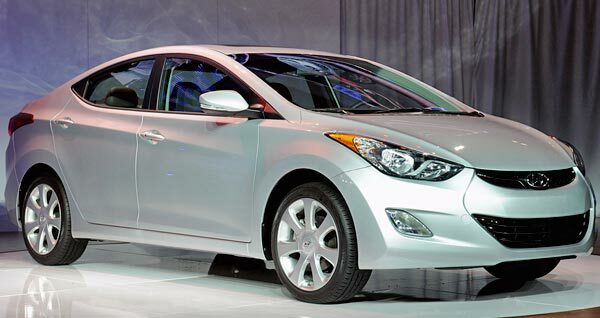 The new Hyundai Elantra 2011, is a worthy brother of the Sonata, and came to complete the redesign of the product line that the South Korean company has been doing during the past two years. The exterior design has the same DNA we can see on all new Hyundai products. Especially in the front, which is a replica of the Sonata model. The rear side has the style of the Tucson SUV. In the lateral line you can note its modern style, which makes look like a sporty car, especially like those well known sports coupes. The most striking thing of the new Elantra is its excellent autonomy, with an EPA estimated fuel efficiency of up to 29 mpg city and 40 mpg on the highway. To achieve this, Hyundai gave to the Elantra a 4-cylinder 1.8L Nu engine which develops up to 148-HP. This engine isn't only smaller than the Beta 2.0L it is replacing, but also is lighter and powerful. It has two transmission options, six-speed manual or six-speed automatic with sequential shifting. Inside offers a pleasant space, youthful appearance and without moving away from the aesthetic and style of the other renewed models of Hyundai. The new Hyundai Elantra is built in the plant that the South Korean firm has in Montgomery, Alabama, which has a production capacity of up to 400,000 units per year. It will be offered in two models, GLS and Limited, with seven different packages to suit all consumer demands. The base price of the Elantra GLS model, the cheapest one of both, is only $14,830. While the Limited model, which comes better equipped, starts at $19,980 and may reach up to $21,980, if you choose the Premium Package equipment.